November 20 – No Germany, no Spain – and now no France. It may be premature to suggest that the power in European football is shifting but few would have predicted the four finalists of the inaugural Nations League competition. With Portugal, England and Switzerland having already qualified for next June’s mini-tournament, the line-up was completed on Monday when the Netherlands – who failed to qualify for the World Cup in Russia – clinched the final spot. 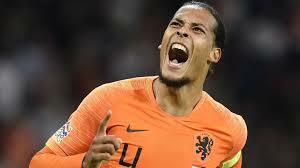 In a game even more dramatic than those featuring England and Switzerland at the weekend, the Dutch recovered to scored twice in the final five minutes – including a last-gasp stoppage-time volley from Virgil van Dijk – to draw 2-2 with already relegated Germany and, just as importantly, knock world champions France off top spot in the group. The Dutch were second best against their biggest rivals for the vast majority of the match following an early goal from Timo Lerner and another from Leroy Sane. But with nothing to lose, coach Ronald Koeman sent van Dijk forward in the latter stages. The Dutch had come into Group A1 as heavy underdogs against the winners of the last two World Cups. “It’s a fantastic feeling. I think we should be all proud of ourselves – I’m certainly very proud of my team,” said captain Van Dijk.